If you often find yourself juggling multiple tasks every morning and can’t seem to fit In time to meticulously style and curl your hair with a curling iron, a set of hot rollers may be for you. This styling tool is quick to heat up, easy to use, and allows for hands-free curling so you can finish your breakfast and send out last minute e-mails before heading off to work. The ReviewLab team has looked at various hot roller sets to find the best available models. We looked at rollers made of different materials, including ceramic and wax, and we also researched travel-worthy models for those on the go. Our buying guide outlines the most important features to look for when shopping for hot rollers, and our individual product reviews go into detail about each of our selected picks. The Calista Tool Ion Hot Rollers won the top spot on our list because of their combination of quality, value, and performance. The heated ceramic rollers come in a set of 12, but the set is small enough to be easily carried. Our runner-up pick features the same quality build as our top choice with comparable value and performance. The included clips, however, aren’t as well made as those included with our top pick. 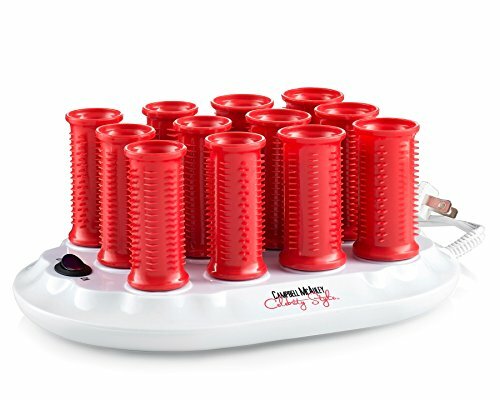 Still, the Campbell Mcauley Hot Rollers are an excellent set of rollers that work remarkably well for curling hair. The Conair Compact Multi-Size Hot Rollers is a set of 20 color-coded rollers. For the price, users get a large set of different sized rollers that works reliably and curls hair well. The size also makes it a great set for travel use. A budget price and combination of features you’d expect in a more expensive unit make the Conair Instant Heat Hot Roller set a great buy. The Jumbo sized rollers are appropriate for adding more body and volume to the hair, however, so don’t expect tight curls from these rollers. 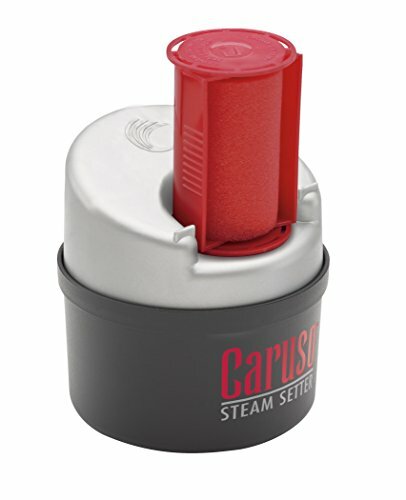 The Caruso ION Steam Hairsetter comes with twelve hot rollers that heat up using steam. They are super quick to heat up, and the set is easy to use. The disadvantage is that each roller needs to be heated individually, but the process is super quick so hair should be rolled up and set in no time at all. The BabylissPRO Titanium Professional Hot Roller set is a professional quality set that uses ceramic technology. 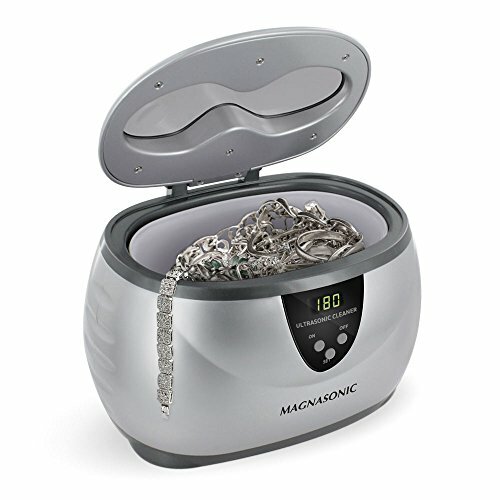 The ceramic heating element helps produce a smooth, shiny finish that’s gorgeous as well as long-lasting. The Remington H5600D Hot Rollers feature a wax core interior, which helps the rollers to conserve heat much longer than other types. The twenty included rollers are plenty for curling an entire head of hair. The Remington Compact Ceramic Hot Rollers is our favorite hot roller travel set because it’s inexpensive, compact, and can be used virtually anywhere in the world. 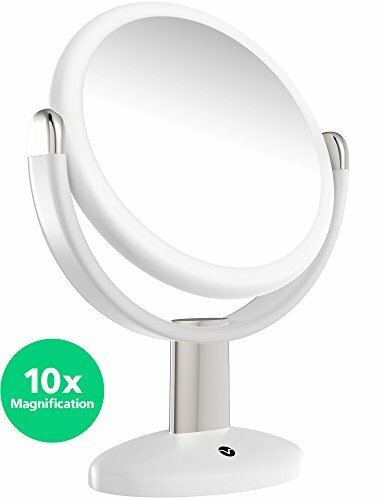 The small size makes it equally useful for those with tiny bathrooms or vanities. Picking out what size rollers you need depends on your hair length and the type of curl you want. If want tighter curls, opt for the smaller sized rollers. Jumbo Rollers are more appropriate for large bouncy waves and adding more body to hair. Some hot roller sets come equipped with multiple sizes, which is perfect for those who might want to change up their style. Longer haired users should opt for rollers that are a bit longer to accommodate more hair. Not every set comes with the same amount of hot rollers. What will work for you depends on how much hair you have. Compact travel sets usually come with at least five rollers. Regular sets will come equipped with 12-20 rollers. If you have thicker hair, opt for a higher-capacity set. Do you have very thin hair that’s tough to curl? Wax core rollers retain heat longer, so they are better suited for creating styles in hard to curl hair. For those who have thick hair, as mentioned, the size and number of rollers are essential. It will usually be easier to use hot rollers on long, thick hair since there’s already more to work with. Users with fine hair may want to consider choosing a set that features hot rollers with small teeth or grips to ensure the rollers stay put when they are rolled up and clipped. If you plan on using your hot roller set elsewhere than home, consider a compact travel set. Travel options are lightweight, usually, come with some kind of carrying case, and are often dual-voltage ready. A travel set isn’t just an option for jet-setting users, though. A smaller set is a convenient option for users with tiny bathrooms or limited storage space. Most hot rollers can be purchased for under $30. The pricier the set, the more durable it will be. More expensive hot roller sets often feature a greater number of rollers. Professional-grade sets typically cost over $60, are fast heating, last a long time, and produce salon quality results. The Calista Tools Ion Hot Rollers snagged our best overall pick thanks to their easy to use design and reliable curling performance. The ceramic element heats up quickly and stays hot long enough to produce lasting curls. Together, the base unit and rollers are compact enough to travel with, and the whole set is offered at a great price. Easy to use. There’s not much to using this hot roller set and reviewers like that they roll up without any trouble. Great value. The price is right for a set of 12 high-quality rollers. Rollers heat up quickly. Reaching the required temperature for curling takes no time at all due to a ceramic element, and a handy indicator lets users know when it’s ready to roll them into place. Lightweight base. The base isn’t overly heavy, and the set comes with a carrying case, making it an excellent travel option. Rollers stay put. Because they’re lightweight, say, reviewers, the rollers don’t fall out of place. Won’t burn the skin. The rollers don’t feel excessively hot to the touch, which helps to prevent painful burns. Not sized for short hair. Users with shorter manes will have a tougher time using these rollers and securing them to their heads. Our second pick for best overall is the Campbell Mcauley Hot Roller set. It works just as well as a more expensive set but with a budget price attached. The roller set is compact and features quick-heating technology for speedy styling. The included rollers have some texture to them so fine hair won’t easily slip away when rolling. The cool-touch ends are another handy feature that make it easy to avoid burns on the fingers. Heats up very fast. The set heats up in less than two minutes, according to many reviewers. Prevents frizz. Thanks to ceramic ion technology, resulting curls are smooth and well defined. Perfect for travel. The hot roller set comes with a travel bag that also fits the included twelve hair clips. Handy indicator. This feature alerts you when the rollers are ready to use. Grippy teeth. Fine haired users really appreciate the teeth that help rollers stay put in the hair, which makes rolling easier. Cool-touch ends. The rest of the rollers get hot enough to curl efficiently, but the ends remain cool for easy handling. Included clips aren’t very strong. Some users feel the clips aren’t suitable for use on thicker hair. Not enough rollers. Again, thicker haired reviewers remark that more rollers would make the set a five-star product. Our top budget pick, the Conair Compact Multi-Size Hot Roller set, offers users a great value. There are a variety of roller sizes and twenty rollers in total. 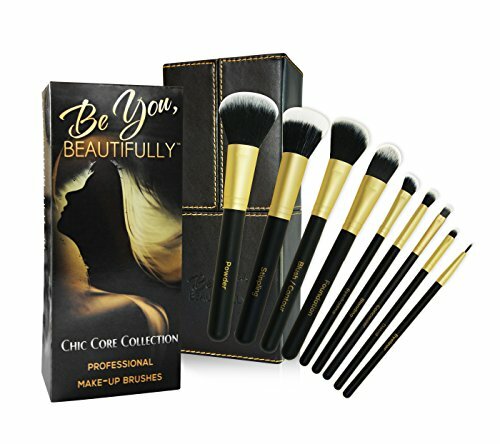 The set heats quickly and features handy teeth to help make curling fine or thin hair a little easier. The compact sizing is good for those with limited bathroom space, and there’s even a spot to store the included hair clips. Value price. For a budget price, users get a set of 20 different sized rollers including eight small ones, six medium, and six large. The set also comes with quality hair clips to keep rollers in place, and a handy storage spot to put them away. Heats quickly. Users like that the roller set gets hot fast. It makes it easy to get ready quickly. Teeth for gripping hair. The rollers have little grips that make it easy to roll up fine hair and stay in place. Useful indicator. An indicator lets users know when rollers are hot, and the machine is turned on. Small size. The whole set is fairly small in size, so it’s easy to store and won’t take up too much room on a bathroom vanity. Not anti-frizz. Quite a few reviewers didn’t like that the rollers tend to leave their hair frizzy. Combination of size may not be right for everyone. Users with very short hair might find zero use for some of the larger rollers. Likewise, users looking for a particular curl type may not use some of the included rollers. Our runner-up for our budget category is the Conair Instant Heat Hot Roller set, which includes five jumbo sized rollers. They’re perfect for creating big bouncy waves, and the set is a great value. Dual voltage means it can double as a great travel set. The rollers are also easy to handle thanks to a velvet covering and cool-touch ends. Great price. The nice looking set of five jumbo rollers is a great buy, say reviewers. Dual voltage. The hot roller set is compact enough to be packed in a suitcase and features dual-voltage making it perfect for overseas travel. Easy to roll. The rollers have a velvety covering, which prevents hair from slipping off them. Stay-cool ends. The ends of the rollers don’t get overly hot, so it’s easy to roll them up without burning oneself. Quick to heat up. Reviewers love how fast the hot rollers heat up. Not enough rollers in the set. Reviewers find that a total of five rollers just isn’t enough for most hair types. This type of hot roller uses steam as its heat source. Steam produces a longer lasting curl that other heat technologies. They work the exact same way as other types of hot rollers, but instead of heating up via a base, the user must heat them individually. Heating, however, is quick and easy, with virtually no wait period. The Caruso ION Steam Hairsetter is the perfect option for those with hard to curl hair. The set of twelve large rollers is easy to use and features ION technology that helps produce a smooth result with zero frizziness or creases. 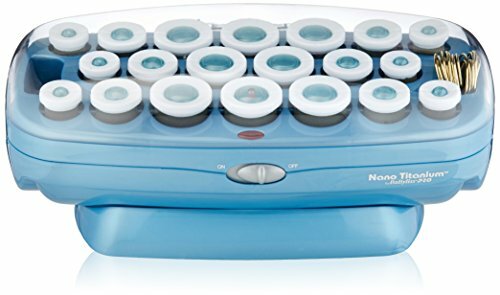 The twelve rollers included must be heated individually utilizing the steam hairsetter and once placed work to set curls in even the most stubborn hair. Affordable. Users appreciate the fact that the set is inexpensive yet high quality. Able to curl even curl-resistant hair. 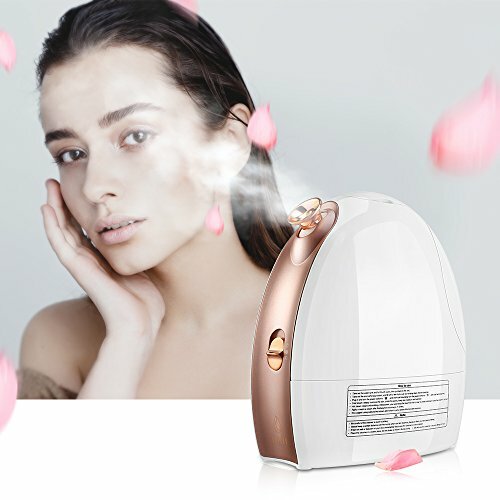 Steam technology helps to produce a long lasting regardless of hair-type. Easy to use. Heating up each roller is super simple and takes just a few seconds. 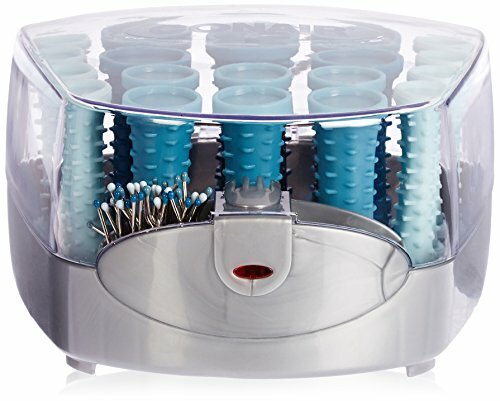 Simply fill the hair setter with water, turn on, and heat up each roller. Includes twelve rollers. The rollers come in both large and jumbo sizes, which are perfect for creating big bouncy waves and curls. Only works with 120V outlets. The hot roller set is not appropriate for travel overseas because it doesn’t work with 240V outlets. Ceramic infused hot rollers are the best option for those with frizz-prone manes. 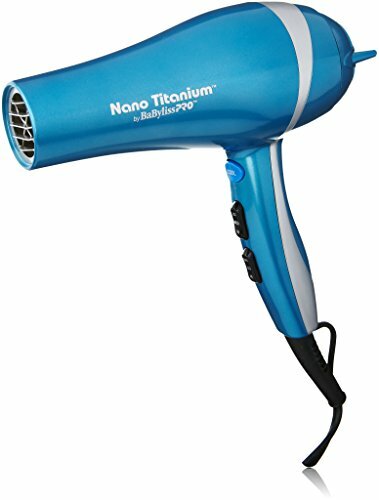 They heat up via an electrical base and with the use of ions help to produce a shinier, smoother curl than other options. They also heat up evenly, so curls don’t come out lopsided or uneven. Those looking for professional salon quality results should look into the BabylissPRO Titanium Professional Hot Roller set. The set includes twenty hot rollers, so it’s perfect for those with a lot of hair. The ceramic infused design ensures that frizz is kept to a minimum and solid clips are strong enough to secure the rollers, even when they’re rolled up with thick hair. Heats up well. 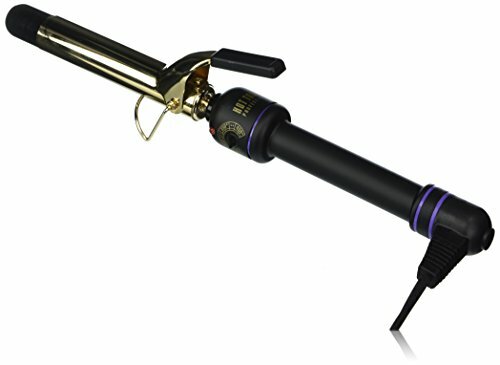 Reviewers point out that the BabylissPRO hot roller set heats evenly to produce long-lasting curls. Frizz-free styling. The nano ceramic technology included in the design of the device helps to eliminate frizz. Twenty-roller set. There are enough rollers in the set to work for those with longer or thicker hair. The rollers are also big enough to accommodate longer haired users. Comes with clips. 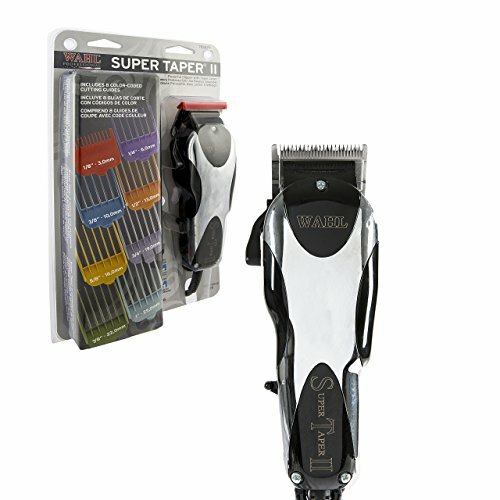 The clips work well to secure the rollers on the head, according to reviewers. Expensive. The hot roller set is pricier than other models but provides professional quality results. 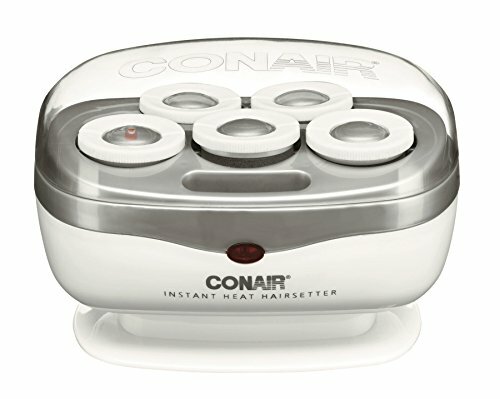 These kinds of hot rollers feature a unique wax center that helps to hold heat longer than with other types of rollers. For users with unusually thin hair who may have trouble getting curls to last more than a few minutes, wax core rollers may be the answer to longer lasting curls. The Remington H5600D Hot Roller set heats up and stays hot thanks to a unique wax core. This helps create longer lasting curls. The twenty-piece set includes color-coded rollers that feature ionic technology for frizz-free styling. Clips are also included and are a special j-shape to help prevent curls from creasing. 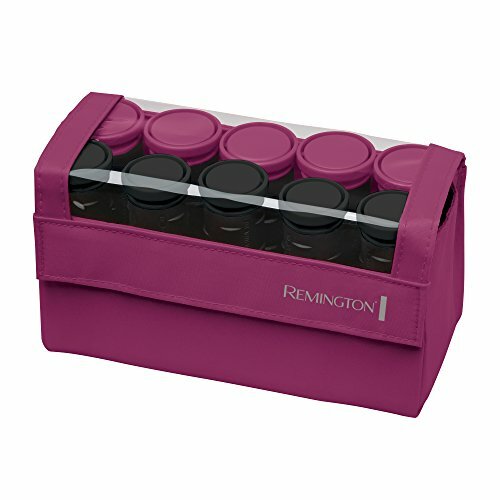 The cool-touch roller ends make the set easy to handle and a 2-year limited warranty make the Remington set an excellent value purchase. Great price. Reviewers appreciate the fair pricing of the twenty-piece hot roller set. Different sizes of rollers. The heated rollers included vary in size. There are three different roller sizes included (three-quarter inch, one inch, and one and one-quarter inch). Easy to use. The set is easy to use since the rollers are color-coded, so no mix-ups occur if you want to use a single size for curling your hair. Indicator light. A useful light lets you know when the rollers have finished heating up. Pins hold well. Reviewers like that the included j-style pins hold the rollers well and don’t leave ugly creases in the hair. Easy to handle. The rollers feature cool-touch ends to help prevent accidental burns. Compact size. The set includes twenty rollers but is not overly bulky. Holds heat well. The wax core stays hot longer than other types of materials. No storage for pins. There’s no storage for the included j-pins, which some reviewers find annoying. Slower to heat than our top picks. Some reviewers point out that the hot roller set takes a little extra time to heat up. Travel hot roller sets are very similar to regular ones expect that they are smaller in size, usually have fewer rollers in total, and are lightweight enough to transport easily. Most travel sets come with a carrying case. The best options will feature dual voltage so that they can be used overseas. 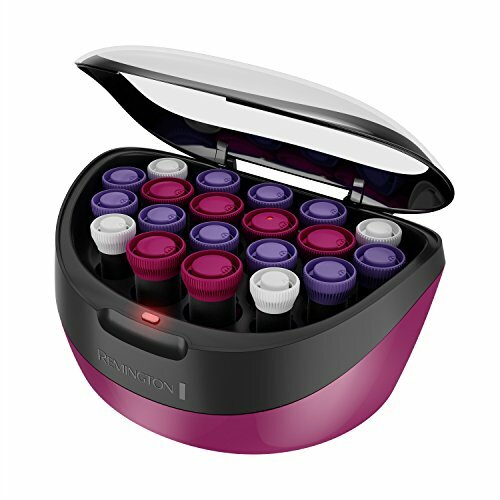 The Remington Compact Hot Roller set is perfect for those who need a useful styling tool on the go. The small set fits comfortably in a bag or suitcase, is reasonably priced, and features color-coded rollers, so it’s easy to avoid mixing up roller sizes. The included clips are sturdy, and the set is dual voltage, so it’s great for travelers who frequently head overseas. Very compact. Naturally, as our travel pick, the Remington set is the perfect size to store in a suitcase or bag. It also comes with a small carrying case so it’s easy to pack up. Affordable. Reviewers appreciate the low price of the travel set. Worldwide voltage. The set can be used basically anywhere thanks to its dual voltage construction. Ionic technology. The hot rollers are ceramic and feature ion technology, which reduces frizz and creates shiny curls. Easy to use. The rollers are color coded so picking out the right size is easy. There are five medium rollers and five large ones. The ends also stay cool to the touch, so that the rollers can be easily handled. Comes with clips. The set includes j-clips that firmly hold hair and won’t crease curls. Not enough rollers for thick haired users. Some reviewers don’t like that there are only five of each roller size in the set. Slow to heat. The set heats evenly but slowly, according to some reviewers.